In 1898, Chicago painting and building contractor Chris O’Brien established an amateur Chicago-based athletic club football team named the Morgan Athletic Club. O’Brien later moved them to Chicago’s Normal Park and renamed them the Racine Normals, since Normal Park was located on Racine Avenue in Chicago. In 1901, O’Brien bought used maroon uniforms from the University of Chicago, the colors of which had by then faded, leading O’Brien to exclaim, “That’s not maroon; it’s cardinal red!” It was then that the team changed its name to the Racine Cardinals. The original Racine Cardinals team disbanded in 1906 mostly for lack of local competition. A professional team under the same name formed in 1913, claiming the previous team as part of their history. As was the case for most professional football teams in 1918, the team was forced to suspend operations for a second time due to World War I and the outbreak of the Spanish flu pandemic. They resumed operations later in the year (even with the suspension they were one of the few teams to play that year), and have since operated continuously. 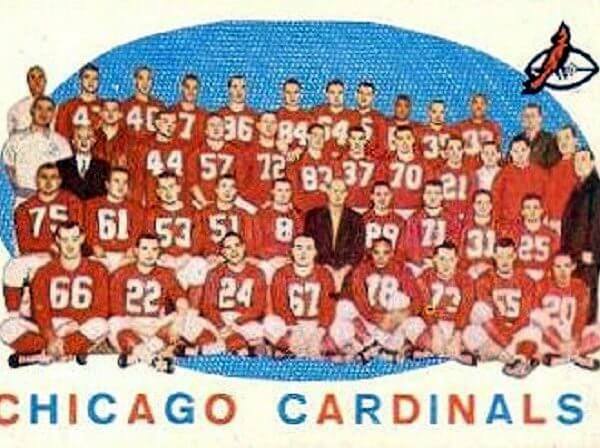 At the time of the founding of the modern National Football League, the Cardinals were part of a thriving professional football circuit based in the Chicago area. Teams such as the Decatur Staleys, Hammond Pros, Chicago Tigers and the Cardinals had formed an informal loop similar to, and generally on par with, the Ohio and New York circuits that had also emerged as top football centers prior to the league’s founding. The 1925 National Football League Championship, claimed by the Chicago Cardinals, has long been the subject of controversy. The controversy centers on the suspension of the Pottsville Maroons by NFL commissioner Joseph Carr, which prevented them from taking the title. The Maroons were one of the dominant teams of the 1925 season, and after defeating the Chicago Cardinals on December 6, came away with the best record in the league. However, Carr suspended and removed the team from the NFL after they played an unauthorized exhibition game in Philadelphia, on the grounds that they had violated the territorial rights of the Frankford Yellow Jackets. Chicago played and won two more games against weak NFL opponents, but were sanctioned because a Chicago player, Art Folz, hired four Chicago high school football players to play for the Milwaukee Badgers under assumed names to ensure a Cardinals victory. Pottsville supporters argue that the suspension was illegitimate because the League did not then grant exclusive territory rights and that- in any event- they had verbal League approval to play the game in Philadelphia. Further, they argue that the Maroons, who were reinstated the next year, would have had the best record had they not been suspended. Others claim that Chicago were the legitimate champions based on the rules of the time. In 1963, the NFL investigated and rejected Pottsville’s case, and in 2003 refused to reopen the case. Both the NFL and the Pro Football Hall of Fame continue to list the Cardinals as the 1925 NFL champion. In 1944, owing to player shortages caused by World War II, the Cardinals and Pittsburgh Steelers merged for one year and were known as the “Card-Pitt”, or derisively as the “Carpets” as they were winless that season. 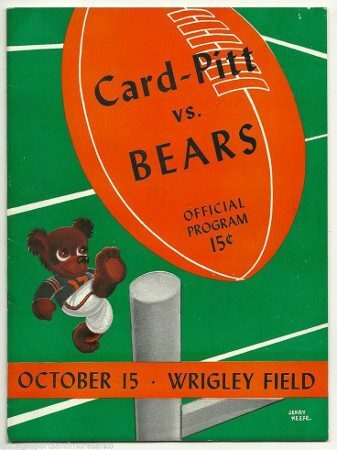 In 1945, the Cardinals snapped their long losing streak (an NFL record 29 games, dating back to the 1942 season and including their lone season as Card-Pitt) by beating the Bears 16-7. It was their only victory of the season. In 1946, the team finished 6-5 for the first winning season in eight years. In 1947, the NFL standardized on a 12-game season. This would be the most celebrated year in Cardinals history as the team went 9-3, beating Philadelphia in the championship game 28–21 with their “Million Dollar Backfield”, which included quarterback Paul Christman, halfback Charley Trippi, halfback Elmer Angsman, and fullback Pat Harder, piling up 282 rushing yards. However, Bidwill was not around to see it; he’d died before the season, leaving the team to his wife Violet. With the team almost bankrupt, the Bidwills were anxious to move the Cardinals to another city. However, the NFL demanded a hefty relocation fee which the Bidwills were unwilling and/or unable to pay. Needing cash, the Bidwills entertained offers from various out-of-town investors, including Lamar Hunt, Bud Adams, Bob Howsam and Max Winter. However, these negotiations came to nothing, probably because the Bidwills wanted to maintain control of the Cardinals and were only willing to sell a minority stake in the team. Having failed in their separate efforts to buy the Cardinals, Hunt, Adams, Howsam and Winter joined forces to form the American Football League. Suddenly faced with a serious rival, the NFL quickly came to terms with the Bidwills, engineering a deal that sent the Cardinals to St. Louis, Missouri beginning with the 1960 season in a move which also blocked St. Louis as a potential market for the new AFL, which began play the same year. The professional American football team now known as the Arizona Cardinals previously played in Chicago, Illinois. In 1920, the team became a charter member of the American Professional Football Association (which became the NFL in 1922), for a franchise fee of $100. The Cardinals and the Chicago Bears (the latter founded as the Decatur Staleys before moving to Chicago in 1921) are the only charter members of the NFL still in existence, though the Green Bay Packers, which joined the league in 1921, existed prior to the formation of the NFL. The person keeping the minutes of the first league meeting, unfamiliar with the nuances of Chicago football, recorded the Cardinals as from Racine, Wisconsin. 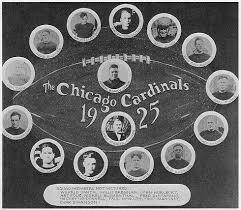 The team was renamed the Chicago Cardinals in 1922 after a team actually from Racine, Wisconsin (the Horlick-Racine Legion) entered the league. That season the team moved to Comiskey Park. Cardinals - Contrary to popular logic, the team was not named after the beautiful bird but instead because the team owner Chris O’Brien purchased used and faded maroon jerseys from the University of Chicago in 1901 and dubbed the color of his squad’s new outfits “cardinal red.” A nickname was born. The team adopted the cardinal bird as part of its logo as early as 1947 and first featured a cardinal head on its helmets in 1960. 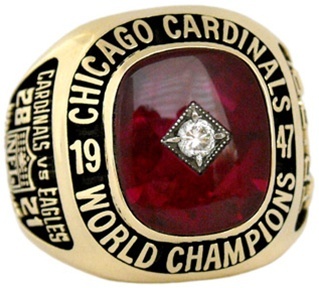 1962 - 1972 / Bill Bidwill and Charles Bidwill, Jr.
Who is the greatest Chicago Cardinals? In 1920, the team became a charter member of the American Professional Football Association (which became the NFL in 1922), for a franchise fee of $100.